Gingerbread Christmas ornaments are decked in deliciously festive style. 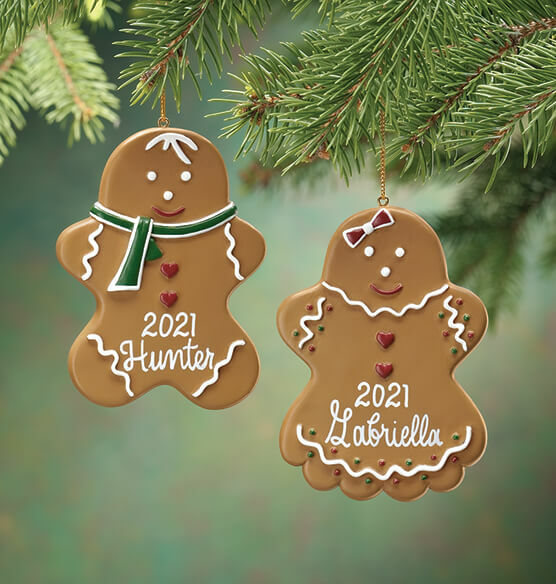 Our gingerbread girl and boy feature merry, “iced” embellishments—each, personalized for one sweet girl or boy! Specify boy or girl. Specify name/message; limit 2 lines, 10 letters/spaces per line. Resin. Personalized gingerbread ornament is 3" L x 3 3/4" W.
I buy ornaments each year for my grandkids. It's a great way to remember each Christmas and the special time it is. I buy my grandchildren ornaments every xmas and these are really cute. Will add nicely to their collections. At Thanksgiving dinner I like to give out personalized Christmas ornaments to my daughter & her family. Great remembrance year after year. Our kids always get an ornament in their stockings. I have bought several from Miles Kimball over the years. These are beautifully done. I bought this for my granddaughter. I get her a new ornament every year. This is really cute! These ornaments are perfect for the annual Christmas ornaments that we give to our grandkids and the personalization is a real plus. They are well made and look like I paid much more for them. My grandson Nathan will love it! This is the 18th personalized Christmas ornament that I have purchased from Miles Kimball. Love everyone of them. Many years ago I started a family tradition that I purchase and gift personalized ornaments for the nieces, nephews and NOW Grandchildren. Each one is unique and perfect for each of the people they have been gifted to. Hope you continue to carry the ornaments and the personalizing service so I can continue the tradition for MANY, MANY years. My grand daughter willbe delighted when she sees her name on this adorable ornament. the grandchildren will love hanging these on the tree. These are Xmas gifts. The ornaments came out beautiful. Very happy. So very cute! Am going to buy some for friends next year!! hope my grandchildren will put these on their trees when they are adults!! Very happy with quality. My granddaughters were happy to see their names spelled their way. Would recommend. These ornaments are so cute. I know my grandchildren will love them. Please keep these for future orders. Love them. Have ordered one for each of my kids and want to keep getting for my grandchildren as they come. Bought the boy and the girl for my twin Grandchildren. I can't say I was surprised by the quality because Miles Kimball's items are always very nice. Love having the year on it. beautiful. I love it. My great niece loves it. It's precious. Will order again. Given as a gift to me by my sister Christmas 2013. It will be a cherished memory each year as I place it on the tree. I anticipate it will be used by my children and grandchildren and hopefully bring a smile to their faces long after I have passed. This was one of the prettiest ornaments I have purchased. It is just perfect. Nice size - quality not cheap. The grandkids are going to love these unique and special ornaments. Very cute. I purchased 3 of these for Grandsons. They liked them and will be used on their Christmas tree for years to come. This ornaments are so adorable. They look so cute on our tree. These are dated and yes, I would buy again. I bought one for each of my nine grandchildren as Christmas gifts. WANTED 1 GIRL + 1 boy gingerbread ornament. Placed order on phone. I asked if the product number was the same for both the boy + girl because I did not fully understand the order instructions. IF I AM remembering correctly I asked about this. I placed the order stating I wanted 1 girl EMILY and 1 boy EDISON. WAS NOT ASKED IF EDISON was a girl or boy assuming the ordering person knew it was a boy. Very disappointed when rec'd. A GIRL FOR EDISON. Called to report this. STill have not REC'D REPLACEMENT. AM I TO RETURN THE INCORRRET ONE BEFORE I REC.CORRECT BOY ORNAMENT FOR'EDISON'? I AM VERY DISCOURAGED = I RECALL PROBLEMS BEFORE. Personalization should be printed instead of being in cursive. I hope to have a granddaughter some day, so I can order another one! Going as gifts for grandchildren nest year. A little upset that the girl gingerbread ornaments were discontinued. BOUGHT THIS FOR MY NIECE. WITH HER TODDLER'S NAME. GOOD SIZE, NICELY MADE, PERSONALIZED W/HIS NAME. One of the gingerbread ornaments did not come with the personalization added. I got them for stocking stuffers for my grandkids. They are cute. Nothing exciting. Nothing gorgeous. Just cute. Grandauter tried to take a bite! It must have looked like a cookie to my one year old granddaughter, because she tried to take a bite when she opened it. I will use it as a stocking stuffer. Much more plain looking than I imagined. The personalized name and date adds a nice touch. Was fitting for our young granddaughter who loves cookies!